Blogville Awesome Retreat(BAR: The Five Pees of Travel - Pee 2 - Preparing!! 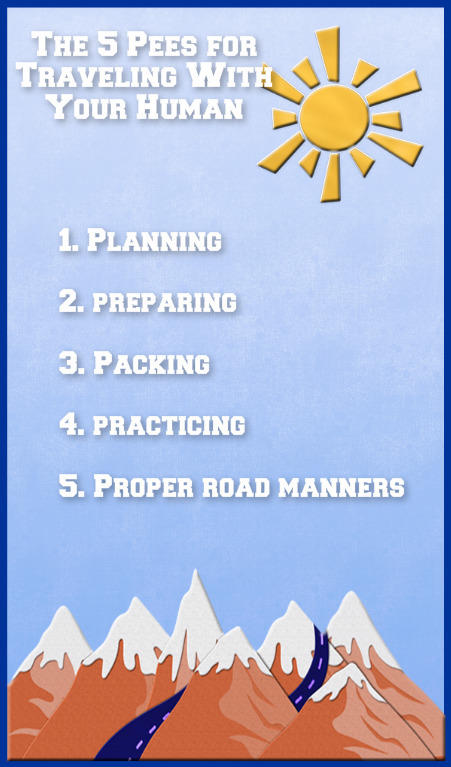 The Five Pees of Travel - Pee 2 - Preparing!! With the BAR coming right around the corner, we wanted to repost a couple of PEES to remind you of things your humans might need to be reminded to do. Proper Road Manners AND BAR Manners!! 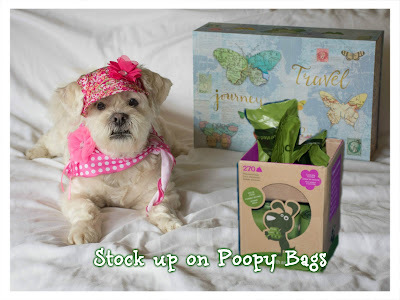 PREPARING for Travel with your Humans!! We're another month closer to the BAR, which means it's time for the next installment of The Five Pees of Travel!! 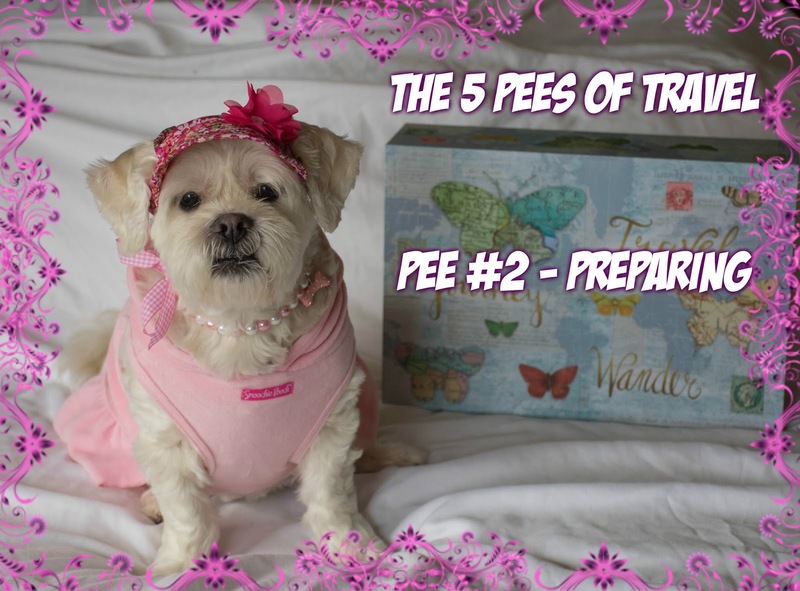 If you missed Pee #1 - Planning, click HERE or visit the Travel Pees page at the top of the page! In this installment, Arty and I are going to cover what you can do to start preparing for your trip to the BAR!! The first important things you can do to start preparing is make sure you current tags! Name/Contact Tag - Make sure sure you are wearing a name tag. You want the other pups to know your name at the BAR, right?? Along with your name, it should also have a phone number where your pawrents can be reached. You never know when your pawrents might get lost and you might not be able to find them. This way someone can call them and tell them how to find their way back. Current Shots and Rabies Tag - None of us like to visit the V-E-T but, before you hop in the car to head to the BAR, make sure your shots are up to date and you are wearing your current rabies tag. 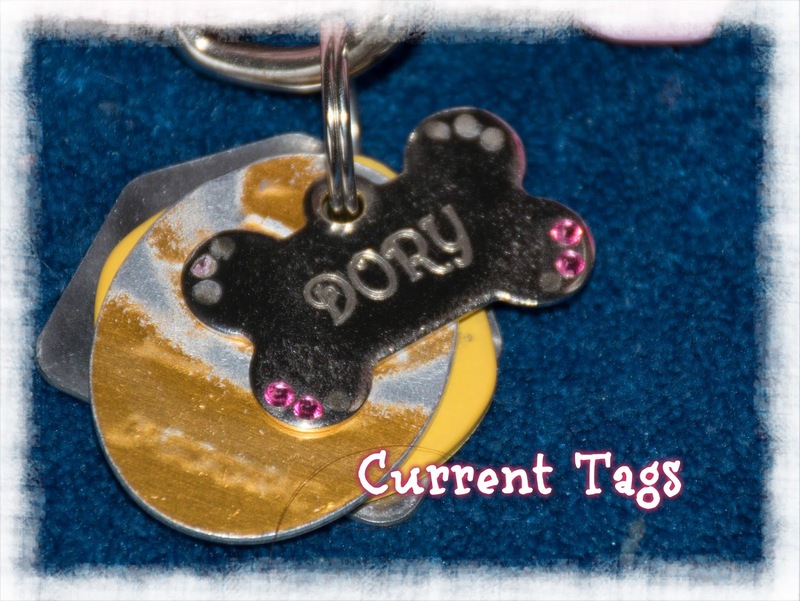 Microchip Tag - We always wear our fashionable Microchip tag! This tag has our microchip number on it for easy look up. All of us here at Dory's Backyard are micro-chipped because, you know, that whole parents getting lost thing. It is also a good idea to have your V-E-T scan your microchip annually to make sure it is still where it is suppose to be! Needless to say, we have so many jingles our pawrents ALWAYS know we are coming!! We may have to wear all those tags...but we make sure Mama always carries the following papers in her....Information Book (What a BORING name, Mama). Mama is a bit OCD when it comes to us, so humor her and nod your heads like this isn't crazy, ok?? BOL! Pet Information - Mama writes a short description of all of us pups. Our likes/dislikes, what scares us, what our favorite cookies are and our descriptions. She also includes a picture of each of us. She does this just in case our parents get lost or if there is an emergency and we need to stay at a spa while we are on the road. Emergency Numbers - Mama includes numbers where Daddy or Grandma and Grandaddy can be reached just in case! She also has the number of our V-E-T on this page. Medical Information and Vaccine Records - None of us are allergic to anything and we aren't taking special medications, but if we were, we would make sure to have a record of what we were taking and how often we needed to take the medication. Mama DOES have copies of all of our most recent vaccinations and vet records. Dog License Paperwork - Because we sleep hard and play hard (and may lose our license tags), Mama keeps copies of our Dog License paperwork in the book. She leaves a copy of this book at home for Nanny Ally when she comes to visit and Mama and Daddy abandon us go on trips! In case you didn't know, we live in the middle of nowhere in a remote area of the country. We are prone to earthquakes and landslides, so Mama always has an emergency kit in the back of the Rogue. We aren't going to list everything we have in ours, just things you might need "just in case". First Aid Kits - Mama has one for her (and Daddy). She bought it prepackaged and then added extra things (like sudafed, ibuprofin, etc) that she might need. 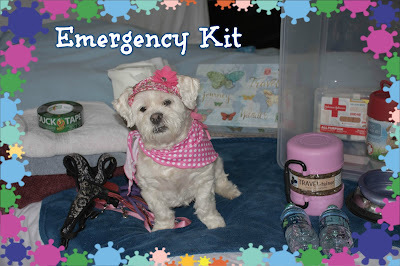 Mama also has one for us that she bought at that Amazon place that has stuff for basic pet first aid. She also has a Pet First Aid book. Extra Food and Water - Mama keeps LOTS of bottled water in the back of the Rogue, she also carries emergency dinner for us in case we are stuck on the road at dinnertime. If you notice, by my annoyed face in the above picture, Mama does NOT carry extra cookies (from Mama - that I tell Dory about because she would just eat them)!! 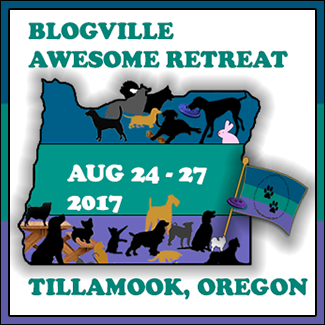 Also make sure you remind your peeps to bring extra food bowls and water dishes too!! Extra Dog Supplies - Extra harnesses, leashes, collars, you name it..Mama brings it. She learned that you never know when a dog Jakey will chew through a harness or leash and you will need a replacement. Towels (Bath Towels AND Paper Towels) - Mama always makes sure she carries at least one towel per pup she is traveling with, and an extra towel in the back seat because you never, ever, ever, ever, can have too many towels!! She carries at least 2 rolls of paper towels. Cleaning solution - Mama carries windex (for dirty windows) and ummm extra strength doggy clean up spray. Cause, you never know if one of the boys is going to hurl. Duct Tape - Mostly because Daddy is an engineer and can fix anything with a roll of duct tape! You can tailor your Emergency Kit to fit your specific needs. 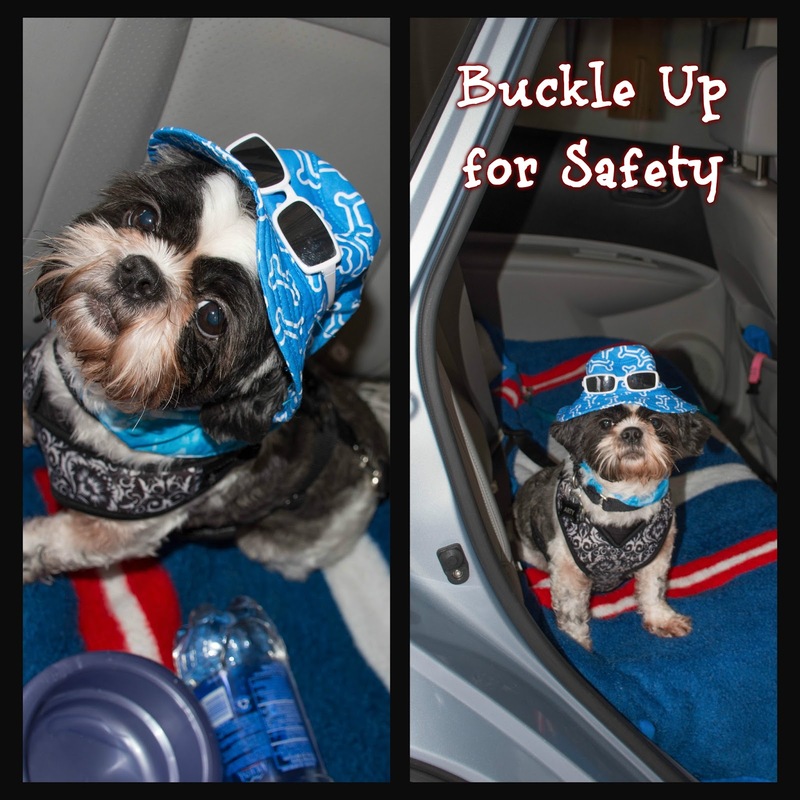 Arty wants to make sure you remember to have your pawrents buckle you up for safety. Whether you have a crate you ride in, or a harness and clip like we do. Make sure every one is safe and secure on the drive! ...and we end this travel"Pee" with a reminder to start stocking up on those poop bags (BOL!!). This is another item you can never, ever have enough of!! Thanks so much for joining us today for Pee #2 - Preparing. Let us know if you have any questions, and we'll try and answer them in the comments! Make sure you join us next month for Pee #3 - Packing!!! We can't WAIT to see everyone at the BAR!!! Those are some really good ideas we are gonna use when it is time to pack! Grreat advice, Dory! I'm taking notes for Momma. We're SO excited to go to the BAR. Right now we're doing lots of practice traveling, going to Auntie Amanda's house for Momma's Renny-sauce faire. Excellent advice!! Arty, we love your hat with the shades!!!!!!!!!!!!!! Those are some very good ideas Dory, they will help mom with her planning for sure. Wow those were some good tips, many I would have never ever thought off. I'm so glad your mom is OCD. Mama is Top Girl Scout for sure! This all sounds familiar! The girls have to bring their favorite toys and blankets too and I have to bring stuff for pug maintenance (baby wipes, ear cleaner). Wet Ones are great to have in your car also! If someone has an accident or you have to pick up something stinky, it's nice to have a Wet One for a fresh smell or clean hands! EXCELLENT.... we took NOTES.... SHOT RECORDS are VERY impawtant to take along!!! Those are all excellent tips! OMD! Y'all are going to have such an amazing time! You are certainly making some wonderful plans and that packing list is perfect. 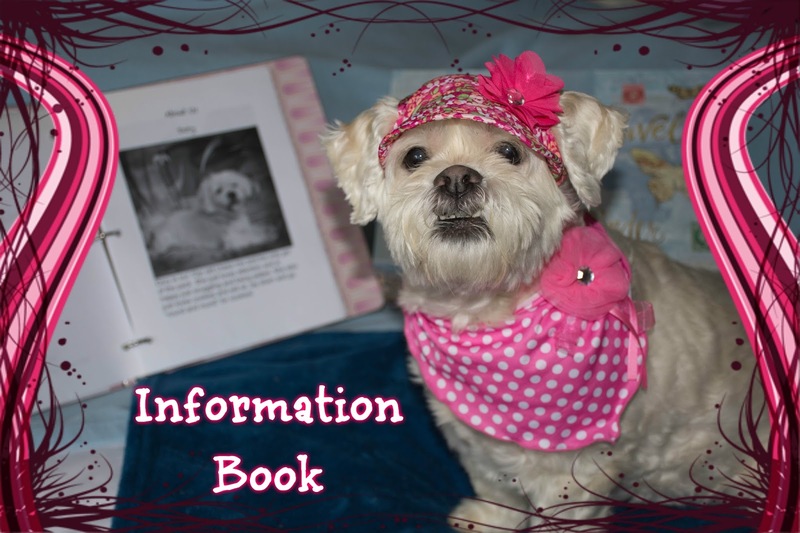 Thank you for the newsy post, especially reminding us of the fairy tale post. We want to try to participate, but you know how forgetful we are. Those are really good reminders! Reminder: Flats and Remembrance Events! !